I am curious, if she is a rescue why would you breed her. Thats what I was thinking, thanks! As far as breeding her, we want to start breeding and you need to start some where right? Our first two mice had litter's shortly after we got them, and he enjoyed it so much and took such a interest in taking care of them. Just my humble opinion, but I'd start breeding with mice I that I had a little more information on (lineage, potential health problems, etc). That way you don't cause a lot of heartache for a pet owner down the line when they buy a mouse from you and it turns out to be prone to tumors or genetic disease. 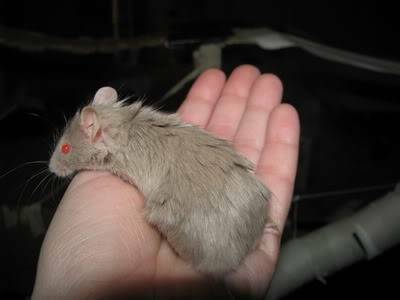 And since you are in MD, it should be very easy to find good quality mice to breed from, instead of rescues. This mouse is from a rescue organization? I was under the impression rescues did not want their animals going into homes that would breed them. I guess to me it just seems to go against the whole rescuing theme. I don't want it to seem like we are all jumping down your throat and demanding you to not breed this mouse, but I agree with what everyone before me said. I would love to get into breeding myself, but I know it is a lot of work, a lot of time, a lot of dedication and a lot of money (not to mention a lot of heartache if you get a huge litter and what to do with all of those babies). If your son wants to help with mouse babies, perhaps there's a mousery around that might want to take on a "helper"? Or a critter shelter that needs a hand? Yes please don't take us all the wrong way. We're here to help, not to hurt! Rhasputin wrote: Yes please don't take us all the wrong way. We're here to help, not to hurt! I agree, please don't think we're trying to gang up on you. Rescue animals, be it a dog, cat, hamster or mice, really should not be bred. For whatever situaltion they came for and ended up at a rescue. She is really pretty. Love her lots. I, on the other hand, am having only silly thoughts tonight. I read this sentence, "My son wants to have babies with her this summer..." and was shocked that anybody would ... uh ... I can't find words delicate enough ... with their own child! Let me clear up she wasn't from any rescue place, a friend was going to let it lose and we took it in. Thanks for the info. Ohhhh Well then that is a different story If u plan to bred her make sure she is a good age. Remember If u get a male. U will have to eventually separate them otherwise they will keep breeding I would care and handle ur girl first. Let her get to know you and ur son Hope this helps. If U go to the show. Maybe the breeders could help u find a good buck for her. U go to the show. Maybe the breeders could help u find a good buck for her. Thanks. We have had her for some time now, she's really sweet too. I think the story of her is in the general mouse section.